The Knesset, Israel’s parliament, intends to discuss next week on a bill that will make it easier to sentence Palestinian attackers to death, Israeli war minister Avigdor Lieberman said Tuesday, vowing to have it passed. “After over three years of a stubborn struggle, the death penalty . 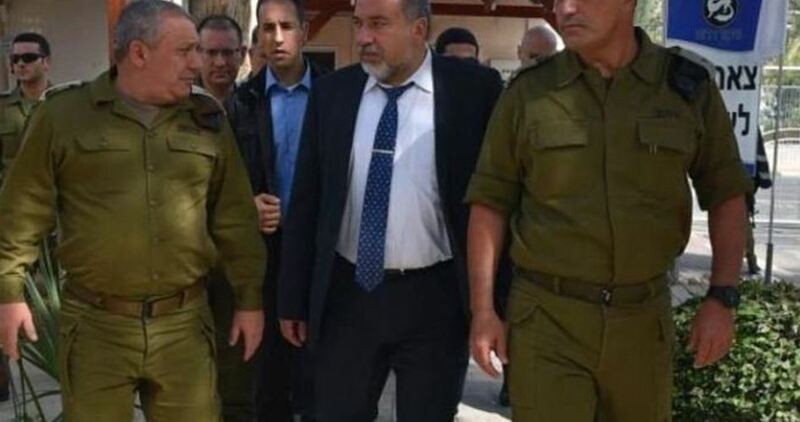 . . will finally be brought to the law committee next Wednesday [Nov. 14], and then for its first reading in the Knesset plenum,” Lieberman said in Twitter remarks. The bill, which passed a preliminary vote by the full Parliament in January, would ease the requirements military courts in the occupied West Bank must meet to sentence Palestinians convicted of alleged crimes to death. Dozens of Israeli soldiers invaded, earlier Wednesday, Shweika area, north of the northern West Bank city of Tulkarem, and abducted a man after interrogating him and his family. Eyewitnesses said the soldiers invaded and ransacked the home of Waleed Suleiman Na’alwa, 59, and interrogated him and his family, before abducting him. Waleed is the father of Ashraf Na’alwa, who fatally shot two Israeli settlers, and wounded a third, in the Industrial Zone of Barkan colony, on October 7th, 2018; the army is still looking for Na’alwa. Since the shooting, the soldiers have been continuously invading and searching the homes of his family, and abducted many of them. A month ago, the soldiers abducted Waleed’s older son, Amjad Na’alwa, 32, who is scheduled to appear in court today. Waleed’s wife, Wafa’ Mahmoud Mahdawi, 53, and his daughter, Fairouz, 33, who teaches at Birzeit University, near Ramallah, are still imprisoned and are scheduled to appear in court, Thursday. Last month, the and handed Ashraf’s parents, an official order for the demolition of their home. Dozens of Israeli soldiers accompanied many colonialist settlers’ buses into the northern West Bank city of Nablus, to visit a historic site, and invaded many neighborhoods in the city to remove the Palestinians from the streets, before clashing with dozens of youngsters, who hurled stones at them, while the soldiers fired live rounds, gas bombs, concussion grenades and rubber-coated steel bullets, wounding at least twenty Palestinians. 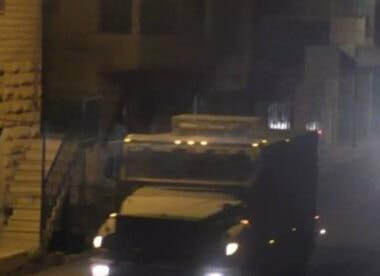 Media sources in Nablus said many army jeeps invaded Amman Street, and the areas surrounding Joseph’s Tomb, east of the city, and attacked dozens of protesters, wounding at least twenty. The invasion was carried out by approximately 1000 settlers, in many buses, and dozens of soldiers in armored army vehicles. They added that the soldiers fired a barrage of gas and concussion grenades at the protesters in addition to a number of homes and shops, causing fire in a shop for selling spare parts for vehicles. The head of the Palestinian Red Crescent Society (PRCS) in Nablus, Ahmad Jibreel, said a young man suffered a fracture in the arm, while another young man was shot with live rounds in his leg, before the two were rushed to Rafidia Hospital. He added that several Palestinians were shot with rubber-coated steel bullets, and fourteen others suffered the effects of teargas inhalation, and received the needed treatment by PRCS medics. In related news, the soldiers stopped an ambulance transporting an elderly woman to a hospital, in the eastern part of Nablus, and forced the ambulance to turn around and look for alternate, longer roads. Furthermore, the soldiers invaded the Dahia area in Nablus city, and Kafr Qalil town, east of the city, before invading the home of Yasser Afeef Amer, and searched the property, in addition to occupying its rooftop to use it as a monitoring post. The army also abducted a young man, identified as Ahmad Anan Mansour, 19, from his home in the city, after invading and reaching it. The Patriarch Joseph is revered by Jews, Muslims, Christians and Samaritans, but Israel only allows Jews into the shrine, as they believe the tomb to be his final resting place. Palestinians generally hold that the tomb is the funerary monument to Sheikh Yousef Dweikat, a local religious and social figure. Israeli soldiers abducted, on Wednesday at dawn, two former political prisoners from Jenin Governorate, in northern West Bank, and summoned for interrogation a young man from Bethlehem. The Jenin office of the Palestinian Prisoners’ Society (PPS) said the soldiers invaded Ya’bad town, southwest of the city, searched homes and abducted two former political prisoners. The PPS identified the abducted Palestinians as Ahmad Tareq Abu Bakr and Ahmad Bilal Abu Bakr. The soldiers also invaded and ransacked the home of a blind man, identified as Ezzeddin Amarna, and interrogated him and his family. Furthermore, the soldiers invaded Teqoua’ town, east of Bethlehem, and summoned Hamdi Ahmad Hamida, 22, for interrogation in Etzion military base and security center, south of Bethlehem, after breaking into his home and searching it. 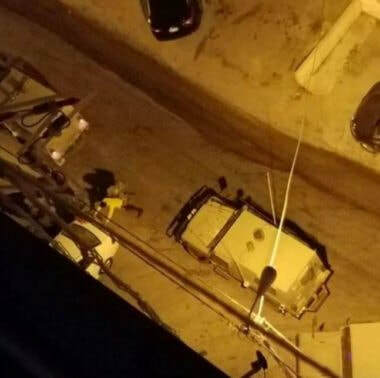 In addition, several army jeeps invaded Nur Shams refugee camp, east of the northern West Bank city of Tulkarem, searched homes and abducted Mohammad al-Azab, in addition to a former political prisoner, identified as Ala’ Yousef Shabrawi. Six Palestinian prisoners have continued their hunger strike in Israeli jails in support of the Palestinian female prisoners’ protest steps. Since 15 September, Palestinian female detainees have been refusing to go out to the prison yard protesting the surveillance cameras installed by the Israeli prison authorities. 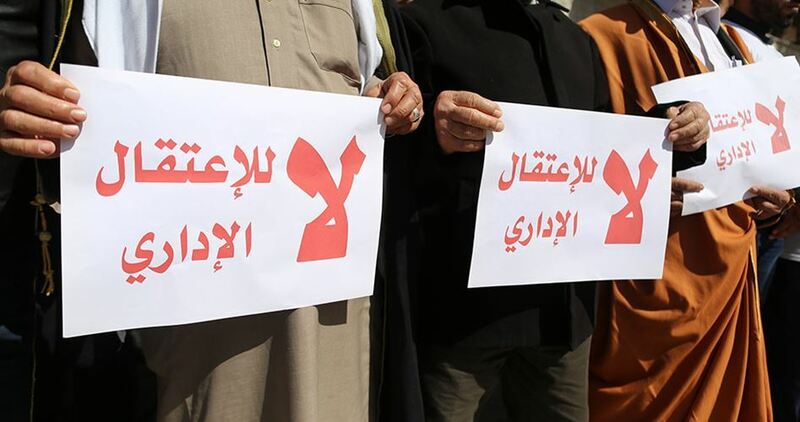 The prisoners Khalil Abu Aram and Kifah Hattab have been on hunger strike for 15 days before being joined by the two prisoners Abdel Rahman Abu Libdeh and Ahmad al-Sir six days later. 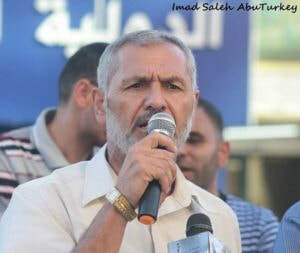 For his part, the prisoner Rizeq Rajoub, 61, declared hunger strike for 13 days in protest against his illegal administrative detention. The prisoner Maher al-Akhras also declared hunger strike for seven days protesting his administrative detention. The Israeli Occupation Forces (IOF) arrested Tuesday evening three Palestinians near Mevo Dotan settlement, illegally built near the northern West Bank province of Jenin. According to Israeli media sources, the detainees were holding a hunting rifle when they were detained at the entrance to the settlement. The detainees were immediately taken for investigation, the sources added. The Palestinian Prisoners Society (PPS) warned of the deteriorating health status of the injured Palestinian detainee Muhannad al-Rajabi, aged 23, in Israeli prisons, holding the Israeli occupation authorities responsible for his exacerbated condition. 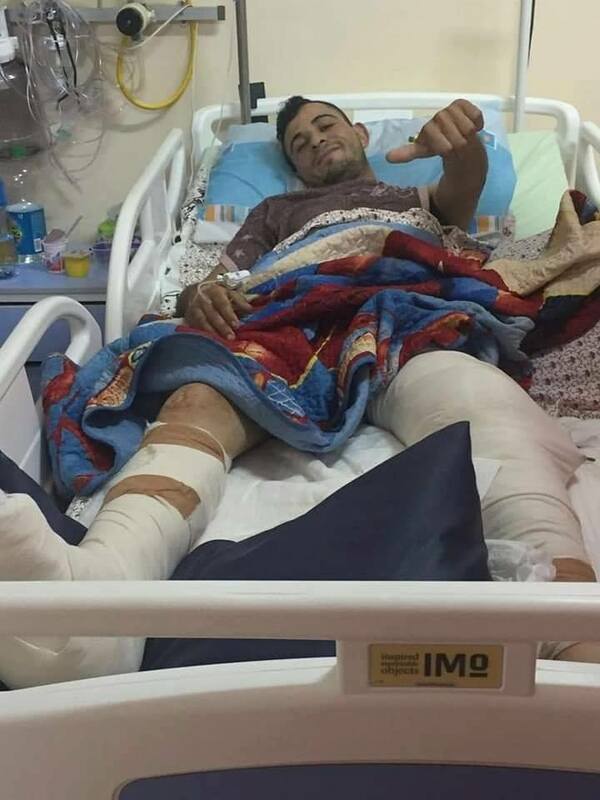 PPS said in a Tuesday statement that al-Rajabi sustained fractures after he was shot with several bullets by the Israeli military in his right leg and should undergo an urgent surgery, according to medics following up on his condition. PPS added that al-Rajabi was injured by Israeli bullet fire a couple of years ago and has been undergoing therapy and check-ups. 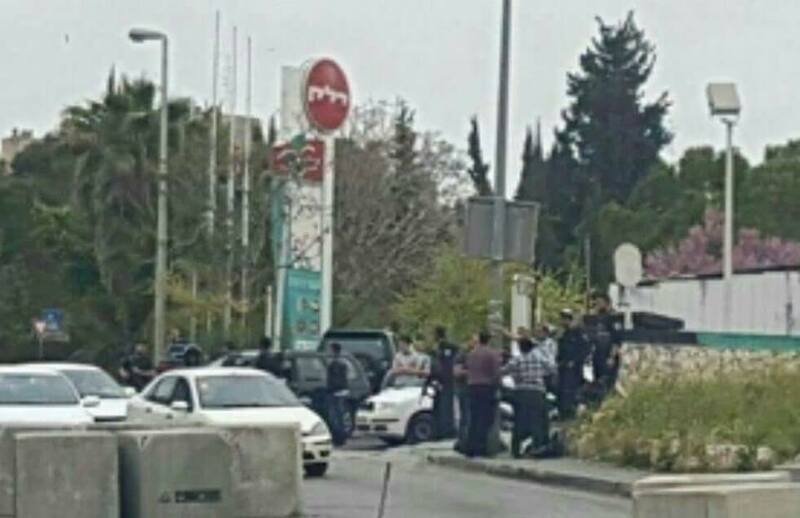 Israeli soldiers shot, Tuesday, a Palestinian woman at a gas station near the entrance of Kfar Adumim illegal colony, which was built on Palestinian lands in the al- ‘Ezariyya town, east of Jerusalem, after she reportedly attempted to stab them. The wounded Palestinian woman, 37, is from Yatta town, south of Hebron in the southern part of the occupied West Bank; she suffered moderate wounds before she was moved to Hadassah hospital in occupied Jerusalem. The Palestinian Prisoners’ Society (PPS) has reported that Israeli soldiers abducted, overnight until morning hours Tuesday, at least eighteen Palestinians, including a wounded young man, in several parts of the occupied West Bank. 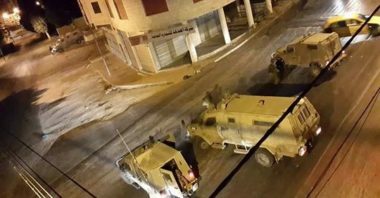 The PPS office in Hebron, in the southern part of the occupied West Bank, said the soldiers invaded and ransacked many homes, before abducting seven Palestinians. It said that the soldiers abducted Mohannad Abdul-Fattah Rajabi, 23, who was shot with seven live Israeli army rounds in his right leg, two years ago, and is still receiving medical treatment. The PPS warned that the detainee will likely face serious complications, especially since he needs surgery, and requires rehabilitation, constant treatment and follow-up. The soldiers also abducted Mohammad Taiseer al-Atrash, 24, Hamza Tareq Gheith, Falah Hamdi Abu Mariya, 22, and his brother Yahia, 24, in addition to Khattab Waheed Abu Mariya, and Mohammad Samir Abu Arram. The soldiers repeatedly assaulted Yahia prior to abducting him. 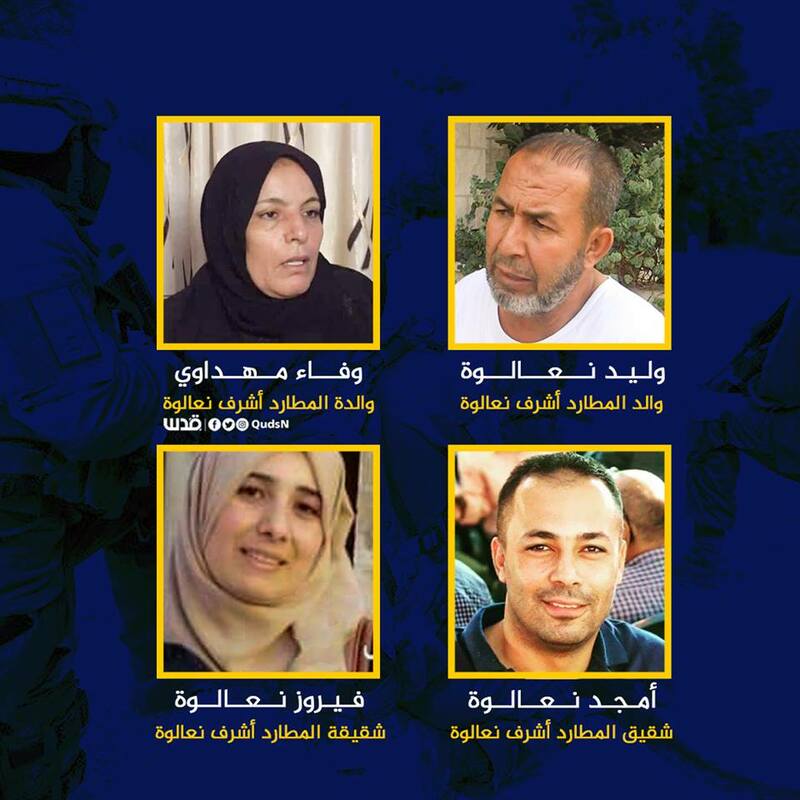 The PPS stated that the soldiers smashed the main door of Falah’s home, and violently searched the property, causing excessive property damage, in addition to striking his son, Haidar, with their clubs and rifles. In Ramallah, in central West Bank, the soldiers abducted Maher Ahmad Thaher, 21, his brother, Mahdi, 24, and Shadi Dar Khalil, 21. Furthermore, the soldiers invaded homes in Hizma town, east of Jerusalem, searched homes and abducted Mohammad Hamza Salaheddin and Mos’ab Abdul-Rahman Khatib. In Nablus, in northern West Bank, the soldiers abducted Soheib Sarkaji and Omar Sarkaji. 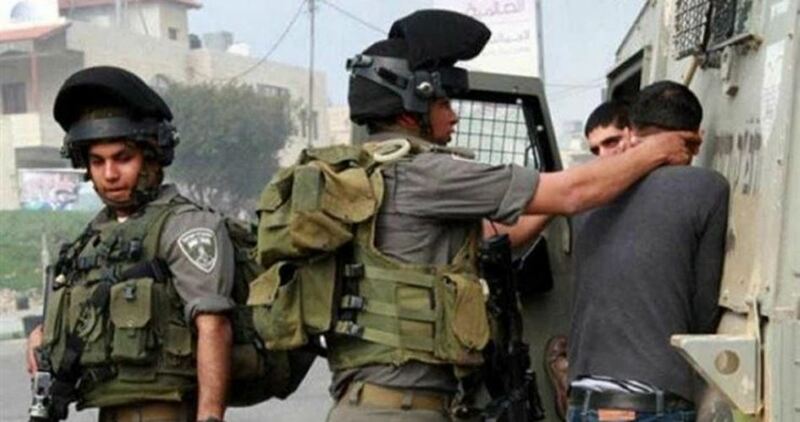 In Jenin, also in northern West Bank, the soldiers abducted Zaher Jamal Za’rour. In addition, the soldiers abducted two Palestinians, identified as Ahmad Shaban Nofal and Mohammad Essam Khaled, from their homes in Qalqilia, in northern West Bank. In the Zawiya town, in Salfit governorate, the soldiers abducted Adham Ismael Saber. 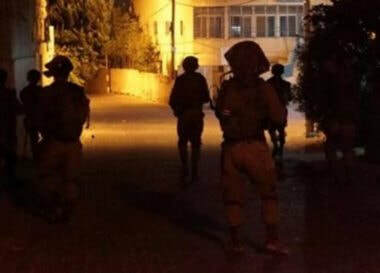 It is worth mentioning that the soldiers abducted, on Monday evening, Majed Rajabi, 34, at a military roadblock near the Ibrahimi Mosque, in the southern West Bank city of Hebron, and Mohammad Abu Arram, from Yatta town, south of Hebron. 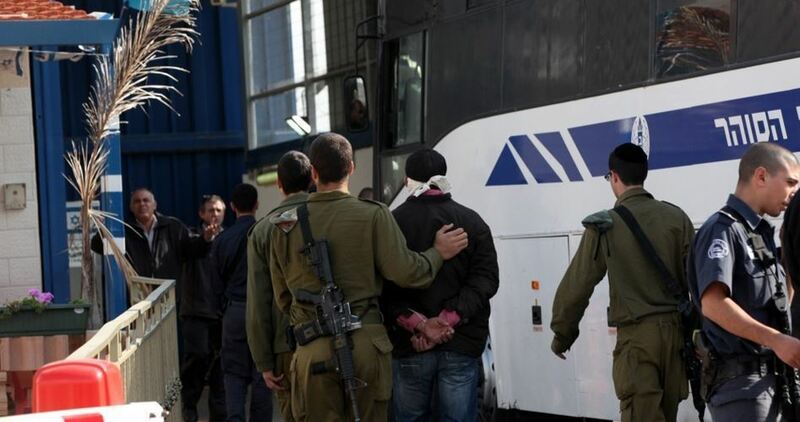 The Israeli occupation authorities renewed the administrative prison term of four Palestinian young men, in the second such sentence issued against them with neither charge nor trial. The four young men received the renewal order less than one hour after they were released from the Ofer jail, following the end of their previous prison term, also itself issued without charge or trial. A PIC news correspondent said the detainees were updated on the renewed sentence half an hour after the Israeli prison authorities gave them back their personal belongings. The four young men are: Mohamed Hamed, aged 26 and incarcerated for a total of five years in Israeli lock-ups; 34-year-old Ghaleb Warda, who has also spent a similar period in Israeli jails; Husain Hamed, aged 25 and previously jailed for one year; and 26-year-old Rashad Hamed, who has been held for a total of two years in Israeli dungeons. Human rights NGOs denounced the arbitrary sentence issued without charge or trial, saying the measure contravenes international laws and treaties.